February has been extraordinary here, milder than usual, with the extreme cold of December just a distant memory for the flowering bulbs, hellebores, pulmonaria and hazel catkins. 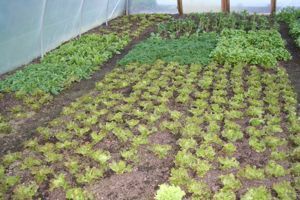 Salad in the polytunnels has been consistently bountiful, except for lettuce which has struggled to be healthy again since the frosts. I am especially delighted with salad under a draughty, home made cloche. 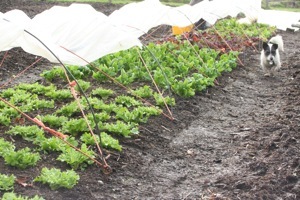 Plants have survived a lot of frozen nights in superb health, with less slugs than usual. If truth be told I meant to water the bed in early November before covering with polythene, because autumn had been so dry, but I never found the time. Fortunately there was enough soil moisture to sustain plants, but the surface has been dry for most of the time. We have picked leaves every three weeks or so and I water thoroughly after each harvest. There is scarole endive (picked like a leaf lettuce), spinach Medania, Palla Rossa and Castelfranco chicory – also picked like leaf lettuce – and Green in the Snow mustard. Fortunately there was enough soil moisture to sustain plants, but the surface has been dry for most of the time. We have picked leaves every three weeks or so and I water thoroughly after each harvest. There is scarole endive (picked like a leaf lettuce), spinach Medania, Palla Rossa and Castelfranco chicory – also picked like leaf lettuce – and Green in the Snow mustard. The latter has disappointed because it is full of small holes which look uncomfortably like flea beetle damage. So much for cold weather killing off all the pests! On the other hand there are plenty of ladybirds. But the presence of flea beetles is a reminder not to sow their much loved mustards, mizuna, rocket and pak choi now, but to wait until late July. 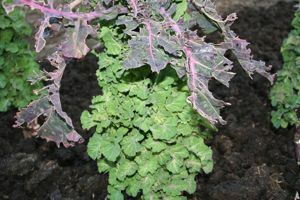 By then, flea beetle season is finishing, and also these plants are coming into a time of growing leaves rather than flowers. Now is time for sowing lettuce, spinach, onions and salad onions, radish, parsnips, broad beans, parsley and early cabbage. If you have the possibility of indoor sowing, it is time for tomatoes, aubergines, peppers, chillies, peas, dill, parsley, beetroot, calabrese, cauliflower, celery, celeriac. Apart from peas and beetroot, I sow all these in seed trays to prick out, for two reasons. Less space and warmth is needed to germinate seedlings, then when pricking out you can choose the strongest seedlings. Pricking out is simple and quick; use a blunt pencil to lift seedlings in the tray, hold them by leaf rather than stem, make a hole in pot or module with the same pencil and then use it to push the root in as well as the stem so that legginess is reduced. For peas I sow three seeds per 4cm module and make sure there is air below the tray so that roots don’t dive into wet sand or anything else; this is called root pruning, keeping all roots in the module. Peas seem not to mind the restricted space, but broad beans do, so I advise sowing them direct in soil. 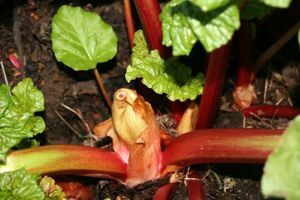 Beetroot work well from sowing three or four seeds per module, thin to four or five seedlings (seeds grow more than one plant), and plant out when an inch or so high after four to six weeks, preferably then covered with fleece. If buying seed, take a look at this brilliant piece http://www.realseeds.co.uk/why.html which exposes many seed fallacies. I am afraid I grow some hybrid (not gm!) seeds and feel less inclined to after reading more about them. The surface of my beds is in lovely condition, after a couple of rakings to knock out surface lumps: the manure and compost on top feels beautifully soft. 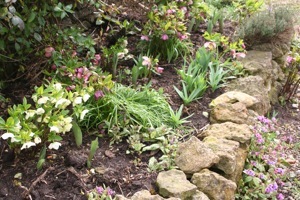 There are no weeds in path or beds so it is possible to sow and plant at any time. Parsnips for instance, simply by drawing a drill in the compost. This is the best time, so that parsnip seed stays moist for long enough to secure its germination. If you have weedy paths, March is a good moment to mulch them for the whole season, say with mypex, to exclude light and allow passage of moisture. 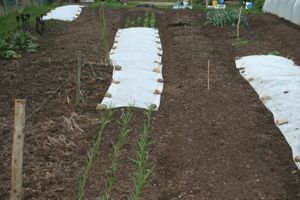 I find that paths receive quite a bit of compost and manure from the beds in spring, when blackbirds kick it around in their search for worms, so a plastic mulch in pathways is soon covered, although it could be used for one season, then removed so that organic matter can feed the soil underneath and worms increase. Paths are an underestimated resource – when clean and with good soil, they afford plenty of rooting opportunities to vegetables. 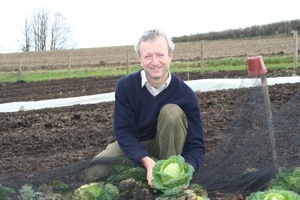 Savoy cabbages have survived the frost and I have kept the pigeons off, just. 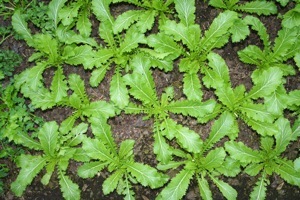 Perennial weeds mostly start to grow in March, such as couch grass, dandelion and buttercup. So, unless you have a thicket, too many to remove by hand, and need to mulch, this is a good moment to remove them, before their new leaves have time to photosynthesise and send food back to the roots. Use a trowel to slide down close to the root and then underneath it, or to cut through it at a depth of three or four inches. Copper trowels are excellent for this, being thin and smooth with an edge that stays sharp. 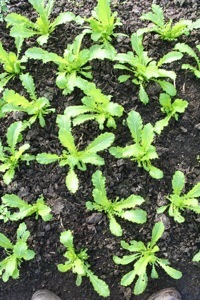 Towards the end of March there will be a first germination of annual weed seedlings. Be prepared with a sharp hoe, to run through the soil surface just below the weeds’ leaves, to cut their stems without dislodging all roots. On a dry day if possible. 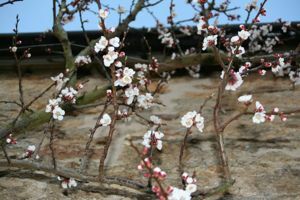 This one act can save a huge amount of work later on, and gives the inestimable feeling of being in control of the garden and able to develop its potential. 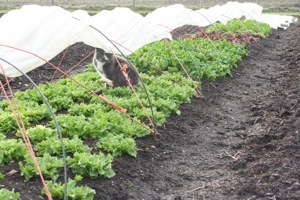 A quick note here because spring is rushing in so fast that some sowings can come a little forward. Parsnips need to be in because the soil is drying fast. It may be worth watering the bottom of drills before putting seed in, then cover with dry soil and walk on the rows to firm the soil and conserve moisture. I did that with carrots a couple of days ago, before covering them with fleece. 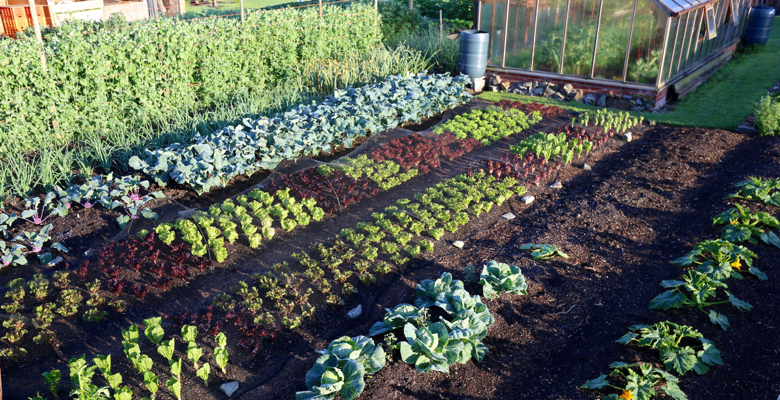 Lettuce, spinach, onions, salad onions and even beetroot can all be planted, if you have some ready. 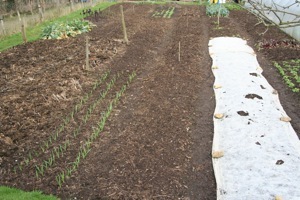 I cover them all with fleece to keep birds and animals off and to help plants establish. Early potatoes can also go in. 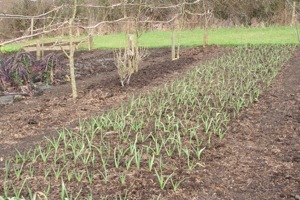 And weeds are starting to grow – with the dry weather allowing some good hoeing. I think it will be mostly dry for quite a while so if you have not dug, well done for conserving moisture.